Hard lessons to be learned, or rather, accepted. The reality of this world is overwhelming to me. I have learned that I am not as strong as I thought I was and not nearly as patient as I thought I was. The reality is that I am emotionally ill equiped, unable to process some of life’s inevitable truths. On one hand, I was protected from some of the ugly truths through my upbringing and my own seclusion when faced with distress, thus causing extreme sensitivity to evil. One the other hand, I was also placed right in the midst of chaos, and attempts were made to protect me, which caused confusion, denial, and conflict. Now, I am an adult and I feel that I am going through an emotional development stage that is very uncomfortable and hard to process. Self-reflection: I have high expectations for mankind, sorrow over the state of mankind, and emotionally processing these truths is difficult. In my head, I know that there are people who boast, and use words to hurt others. Their tongues (spoken or written word) are their weapons! I know that there are people who are selfish, out for themselves at the expense of others. I know that there are people who are loathsome, hate and ugliness spills from their core. And, there are people who put themselves above others, looking down as if they were given some special appointment, entitled with arrogance. This I know, and I must truly accept and embrace, InshaAllah! But, I fight it, which is wrong! And this causes internal stress and turmoil. I have learned that my brain and heart are so intertwined that it is very difficult for me to process the spread of hate, of lies, of attacks, and hurt. I often feel as if I am walking along the perimeter, gazing in occasionally and quickly turning away. And, when I am swept into the reality and slapped in the face with evil, I feel like a stranger in a strange land. My world spins into reaction, unhealthy reaction. And, I acknowledge that I can possess these characteristics as well and I ask Allah to keep me from acting or reacting with the use of attack, hate, or intentional hurt. I know that, although I strive to perform countless good deeds, InshaAllah, I will receive blessing for not committing a bad deed, even if the thought crossed my mind. My internal struggle, my jihad, is with my own simplicity, my own understanding of life’s purpose which I know to be true, clouded by the fact that others turn from the truth. My fishbowl is filled with worship of Allah, with love, purpose, gratitude, reflection, healing, and understanding, along with pain, sorrow, soul-searching, anger, incomprehension, and sadness at the state of mankind. Also in my fishbowl is my knowledge that this world is filled with people know their true purpose, who are kind, and whose tongues are their gifts, who are selfless, who work towards the betterment of mankind, and who embrace all of mankind as their brother/sister. They treat all of Allah’s creation with love, care, and respect. They acknowledge that we were all placed here as Allah’s vicegerents on Earth. I know that there is good and I know that there is evil! But, when that evil enters my world, enters my fishbowl,…..my quiet turns to chaos. Turbulence stirs within the bowl. Why do I need to embrace this turbulence? Because I know that nothing, not one thing happens without the Will of Allah. Everything is a creation of Allah and He created mankind, and only mankind, with the attribute of free will. It is this free will that allows us to either follow His command and gain a beautiful reward in the Hereafter, or turn away from His command and receive a just and severe punishment in the Hereafter. It is entirely our choice! All of the knowledge I gain, all of the experiences, the joy and the heartache, the pleasure and the pain, all continue to be tests for me and all of them will make me a stronger individual who will receive blessings from our Creator as long as I stay the course and fulfill my obligations on a daily basis. InshaAllah. He has made it easy for me to gain faith. 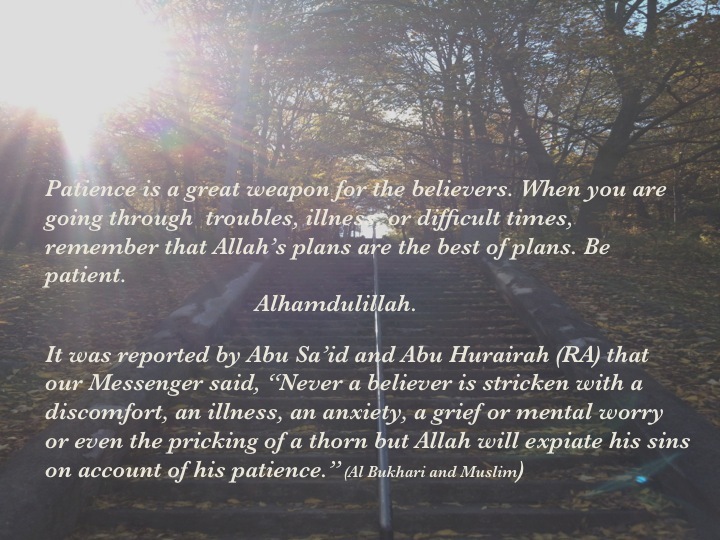 He has allowed me to gain faith, now I must learn ask for continued patience to endure struggles within this life, InshaAllah. My bewilderment, my confusion, my struggle? Why would anyone want to make the choice to stray from His command. Why would anyone want to make that choice? The choice to take the hellfire over paradise? Why would anyone want to choose, through arrogance and selfishness, to take the path that clearly leads to pain over a path that leads to endless beauty and reward? Why would anyone want to sacrifice their everlasting life for a brief “want” within this world? Why would anyone want to jeopardize this? Why, for a short lived satisfaction would anyone risk complete and eternal bliss? I am comforted by the fact that if I don’t possess the ability to change something with my hand, or by speaking directly about it, I can, at the very least, change it with my heart, InshaAllah. I have been put in situations that are foreign to me, hurtful situations that have caused what I have self termed “post traumatic emotional stress” experiences that are relived instantly upon the slightest word, situation, misinterpretation, or painful reminder. I am healing with the help and guidance from Allah. I am learning with the help and guidance from Allah. I know my faith, I know my purpose, and I am comforted in this. This is what brings me back and expands my fishbowl to allow for growth. This is what allows me to accept the evil. 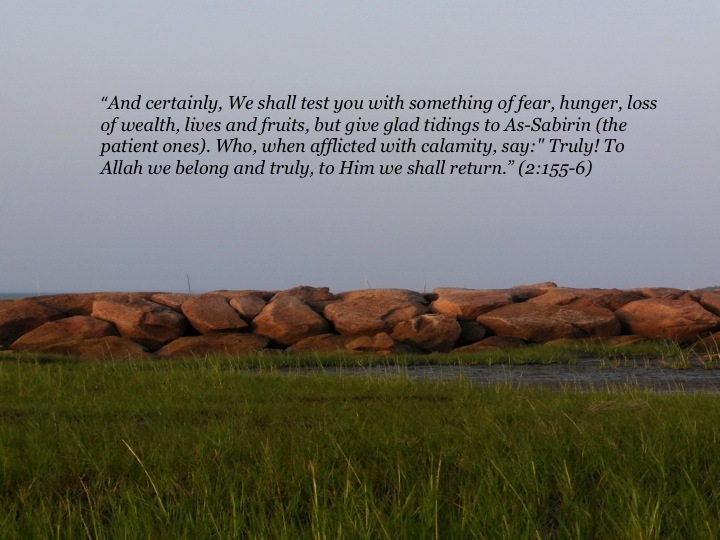 I will be tested, I will embrace these tests, and I will be patient, InshaAllah. This entry was tagged islam, self reflection. Bookmark the permalink.